Smoking costs the NHS five times as much as previously thought, researchers have calculated. Treating disease directly caused by smoking produces medical bills of more than £5bn a year in the UK. In 2005, smoking accounted for almost one in five of all deaths and a significant amount of disability, the Oxford University team said. The British Heart Foundation who funded the research said tighter regulations were needed on the sale of tobacco. The figure of £5bn in 2005-06 equates to 5.5% of the entire NHS budget. Previous estimates have put the burden of smoking on the NHS at £1.4bn to £1.7bn, the researchers reported in Tobacco Control. But these were based on data from 1991 and because such studies are complicated to carry out, it has not been updated. For the latest analysis researchers took into account data from the World Health Organization study of what proportion of a disease is caused by risk factors such as smoking, NHS costs and UK deaths from smoking-related diseases. 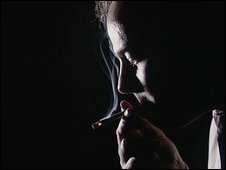 They calculated that in 2005, smoking was responsible for 27% of deaths among men and around one in 10 among women, a figure that has not changed much in the past decade. When looking at the costs to the NHS, they calculated that treating cancer caused by smoking costs 0.6bn a year and cardiovascular diseases cost 2.5bn a year. Long-term lung conditions cost £1.4bn. This annual cost is still likely to be an underestimate, they say, because it does not include indirect costs, such as lost productivity and informal care, the costs of treating disease caused by passive smoking, or the full range of conditions associated with smoking. However, the study is based on data collected before the ban on smoking in public places came into force. Study leader Dr Steven Allender, said the increased costs were largely due to increasing expense of treatment on the NHS with better treatment and technologies. "The story is not so much the five-fold increase but that £5bn is an enormous number regardless. "There's two different ways of looking at this - one is if nobody smoked we would save £5bn but the alternative view is this is an enormous health problem and should be moved back up the policy agenda." Drawing on their previous work on other lifestyle issues, he added that smoking cost five times more than lack of physical activity, twice the cost of obesity and about the same as an unhealthy diet. A separate paper published by the team in the Journal of Public Health found that alcohol consumption costs the UK NHS £3bn. Betty McBride, policy and communications director at the British Heart Foundation, said: "This is money being drained out of the NHS as a direct result of something we have the power to prevent. "Yet the true tragedy of this monstrous figure is the lives that are cut short or ruined as a result of smoking. "This study shows exactly why we need the strongest possible measures to control the sale of tobacco." I do think if you smoke, maybe you should pay some kind of premium for treatment if a smoking-related illness arises. A Department of Health spokesperson said: "The government has made great progress in cutting the number of people smoking by nearly 2.5 million over the last ten years but with 21% of adults still smoking in England, there is much work left to do. "We will be publishing a new tobacco control strategy this year to ensure England can look forward to a tobacco-free future." However, Simon Clark, from the smoker's lobby group Forest, said the figure in the report was a guesstimate, and should be treated with contempt. Mr Clark said it was preposterous to suggest that the cost of smoking to the NHS had risen dramatically, as smoking rates had been falling for 50 years. He said: "Even if it was true, smokers still contribute twice that amount to the Treasury in tobacco taxation and VAT. "Far from being a burden on society, smokers make an enormous financial contribution."